50Weapons’ very own French signing, Bambounou, has a musical characteristic that remains as original and distinctive as his signature hairstyle. 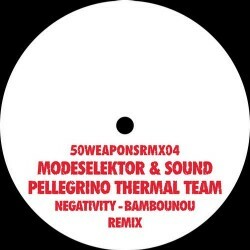 Remixing Modeselektor and Sound Pellegrino Thermal Team’s collective track “Negativity”, released on Sound Pellegrino’s Vol. 1 compilation, it didn’t take fellow collaborators and Monkeytown/50Weapons label heads long to call upon Bambounou to insert his specialized French glaze and develop a suited interpretation for the track. Contrasting the original by taking emphasis off the “big room” setting, “Negativity” transforms into a ductile sound that makes no compromise to the upbeat zest we expect from the 50Weapons native. With its technical unrest, one loses composure with the track’s kicks, 808s, and stirring demeanor that demonstrate an artful dash in today’s machine music culture. A track worth the thrill, it drops just in time for festival goers to enjoy on those proper sound systems.